Thomas “Tommy” Henry Bolt was born in Oklahoma. He served in the United States Army during World War II and turned professional in 1946. He worked as a caddie and club professional in Shreveport, LA. He did not join the PGA Tour until he was in his thirties, but he went on to win fifteen PGA Tour titles, including one major championship, the 1958 U.S. Open. Bolt was a member of the United States Ryder Cup teams of 1955 and 1957. 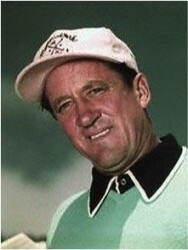 He was inducted into the World Golf Hall of Fame in 2002. Bolt’s fiery disposition earned him the nickname “Thunder” and “Terrible Tommy”. He was known to break clubs during rounds, and his penchant for throwing clubs led to the adoption of a rule prohibiting such behavior. In his later years, he admitted that a lot of his on-course eruptions were merely showmanship and that he felt they had detracted from his playing. Bolt died in Arkansas at the age of 92.